Born out of the wildly popular blog Kale & Caramel, this sumptuously photographed and beautifully written companion presents more than eighty-five deliciously creative recipes that feature herbs and flowers in food and luxurious do-it-yourself beauty products. Founder of the hugely popular blog Kale & Caramel, plant-whisperer, writer, and photographer Lily Diamond believes herbs and flowers have the power to nourish inside and out. In this collection of new and popular recipes, she shares irresistible sweet and savory foods and tonics—for breakfast, lunch, dinner, and dessert—that are vegetarian or vegan and whole-food based. Each chapter is a celebration of an aromatic herb and flower, including basil, cilantro, fennel, mint, oregano, rosemary, sage, thyme, lavender, jasmine, rose, rose geranium, and orange blossom. Guided by the principle that what goes on your skin should be pure enough to eat, Lily offers simple recipes for luxurious plant-based infusions, face and body masks, scrubs, and moisturizers. From watermelon cucumber salad with crispy Thai basil dressing and roasted fig pizza with truffled chèvre to jasmine cacao nib ice cream, pink grapefruit, cucumber and rose skin quencher, and citrus blossom brightening scrub, this is food and body care for all five senses. Lily’s warm and unflinchingly honest voice—which keeps Kale & Caramel readers coming back week after week—tells the story of using her kinship with plants to heal after her mother’s death. Bright flavors, gorgeous scents, and sensuous textures will guide you into a new relationship with plants, friends and family, and yourself. 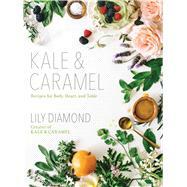 With more than eighty recipes and over one hundred gorgeous photographs, Kale & Caramel creates a lush garden of experience open to harvest year round.